It has been nearly five months since the costliest tropical cyclone on record made landfall in southeast Texas and the surrounding area, inundating hundreds of thousands of homes and displacing tens of thousands of people. Victims of Hurricane Harvey’s path are still recovering, and last week, students from CUAA were able to play a part in the recovery. 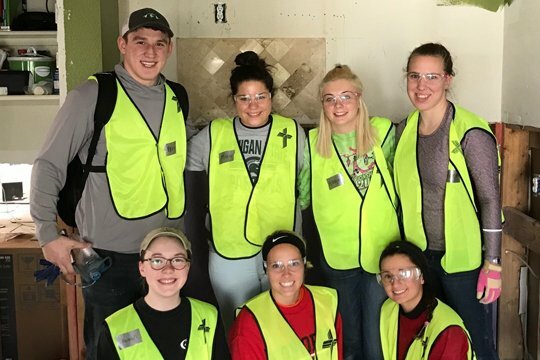 From January 2-6, 2018, Duncan traveled to Houston, Texas with 16 students from Concordia University Ann Arbor to aid in the ongoing hurricane relief, a majority of their time spent insulating and installing dry wall in homes that were completely gutted after being submerged in over four feet of sewage water. Concordia’s team partnered with Trinity Klein Lutheran Church in Houston, Texas and Salem Lutheran Church in Tomball, Texas who are both members of Heart for Texas, an organization made up of a coalition of Lutheran organizations that formed in the wake of Hurricane Harvey, serving as boots on the ground to provide disaster relief throughout southeast Texas. Hare went on to share that one of her favorite parts of the experience was being able to interact with the family that owned the home they were repairing. Each year, Concordia’s campus ministry department hosts a number of mission trips for students to be a part of. Some trips are reoccurring, like the annual trip to New Orleans over spring break, while other mission teams are formed on an as needed basis, such as this trip to Texas. CUAA will also be sending 11 students to Guatemala in March. “This was the first mission trip for two-thirds of the students who went on this trip, and I was blessed to witness the deepening love for each other and the Lord by these students during tour time in Houston.” said Duncan. Hare shared that this was her first time doing a mission trip, and she hopes to join CUAA’s trip to Haiti next year if she is able to raise the funds.